I am now known to many as "The Angel Lady" or "The Angel Whisperer". 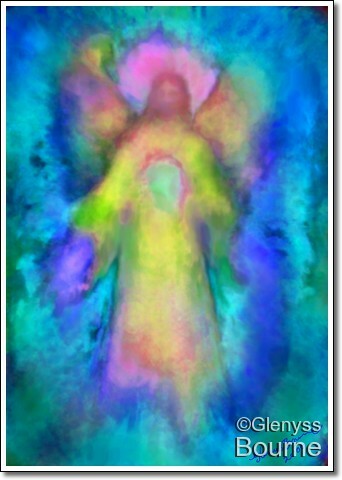 I have spoken with, been guided and healed by Angels; and I PAINT Angels. 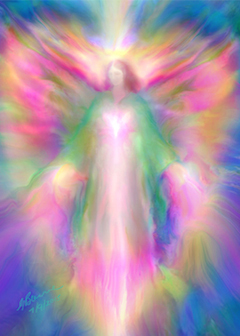 I not only been truly touched by an Angel - I have been touched by hundreds of Angels and Archangels. I have many clairvoyant friends who have confirmed to me that what I paint is the closest to the real Angels as it is humanly possible to achieve. 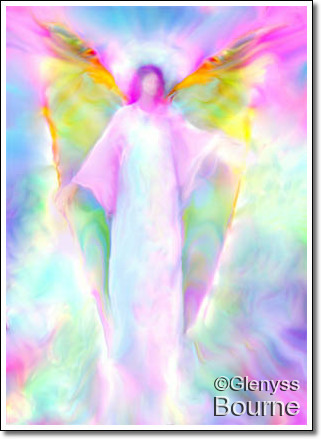 Words alone cannot describe the feelings and inner knowings that you experience when you encounter an Angel. 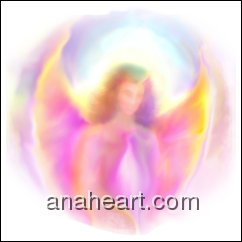 This blog is dedicated to exactly that...to help to empower people to speak of their Angel experiences; and to help others to seek out the Angels who tirelessly guide and protect them, and interact more fully with them. So I guess I will begin with some of my own Angel stories and Angel pictures, and please feel free to add your own Angelic true life stories to mine. The funny thing about Angel Experiences is they happen when you least expect it....where do you think I was when the idea for this blog CAME to me .... I was hanging out the washing about thirty minutes ago and thinking of nothing in particular and all of a sudden this great idea came to me together with the Domain Name, which was still available and waiting for me. I am not much of a writer in fact I don't like writing much but when I am inspired it comes so easily.I have learned that when it you receive guidance and information from Angels or from Spirit you have to write it down straight away or you tend forget it. So I came straight in from the washing line, sat at the computer and created this blog. I love Divine Guidance! Angels have come OUT!! 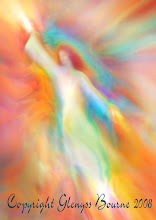 Everybody is now becoming aware of their Guardian Angels. 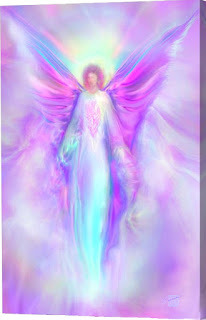 Spiritual authors like Doreen Virtue and others have written many books on the subject of Angels. 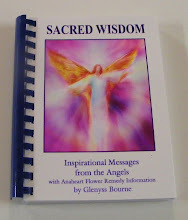 My first Amazing angel story describes how my own book of Angelic Guidance, Sacred Wisdom came about through divine guidance. 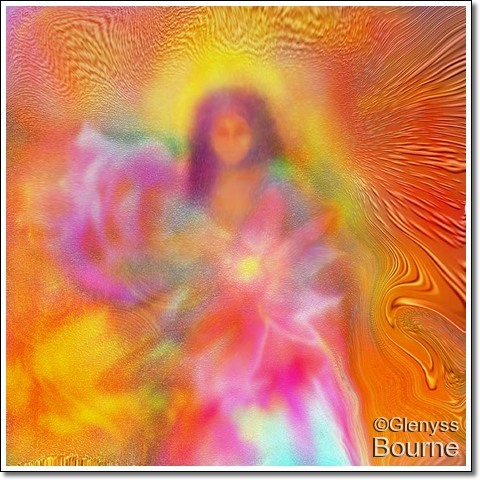 To see my Angelic artwork, that was inspired by the Angels and Archangels visit my online galleries below. I received this email about a pendant made from one of my Angel paintings -" Jesus Unconditional Love". Last week I received the Jesus loves you pendant. Immediately I felt something special, gentleness, peace. As though a very nice loving older brother entered into my life. I believe this is the most precious gift I ever got. It was a day after my birthday. A couple of days later I lost it on my way to my work, I rushed back to the place where I could have lost it. I the meantime I thought of the words: 'Before everything else look for the Kingdom of God and everything will come to you', I found it again and was very glad. I realize more than ever what is the most important thing in our life. It helps me constantly, today I had a singing lesson and when I held the pendant I could sing better. I ask inside me what I can do and the answer comes to me immediately. Asking blessings for a performance wilt my mentally disabled friends, I touched the pendant and I felt a dome of light. It is not the first time I noticed the protection of light beings, but this time it was more tangible. In our journey into the empire of the Spirit this pendant is a very helpful guide. What a gift you have to put the energy of Jesus in the pendants you make! We (my husband and I) thank you very much for making these beautiful jewelry that is charged with this precious energy. Thank you and may God bless you in your beautiful work! 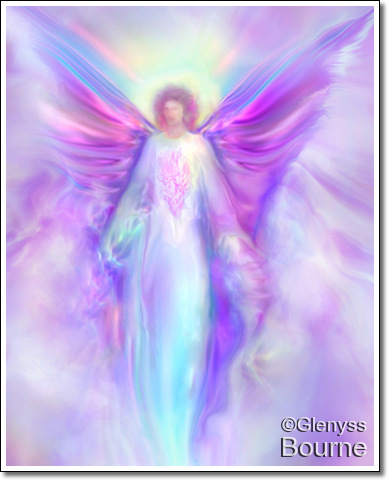 Sincerely, Gerda"
Many people who have purchased my painting of Archangel Raphael, have felt comfort and healing emanate from the image and have shared their experiences with me. This is one of the most profound . Since residing at her home his image has developed even more and two smaller figures have appeared besides him which my friend believes are her daughters and it gives her tremendous comfort. 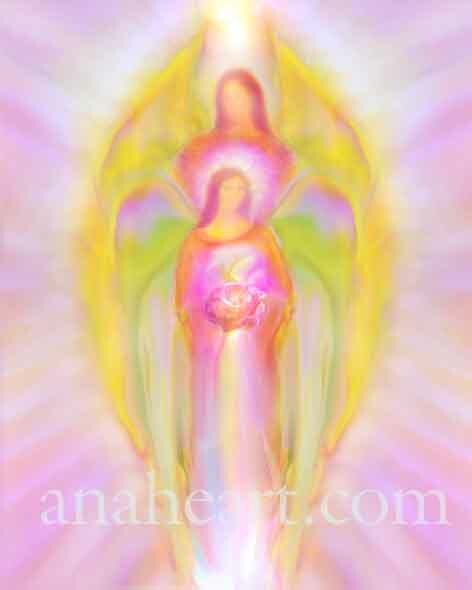 This is my painting of Archangel Raphael which I purchased to put in my healing room which sits above my therapy bed. 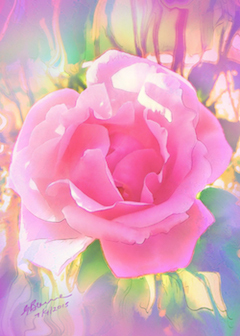 I absolutely love the energy that comes through - healing, love, light, calm, peaceful. Archangel Gabriel Helps Grieving Mother. 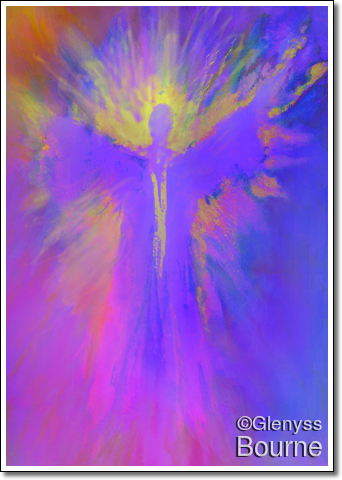 Many people who have purchased my painting of Archangel Gabriel have told me that they have experienced comfort and healing emanate from the image. 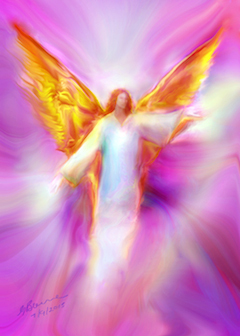 I recently received this email about my painting of Archangel Gabriel. 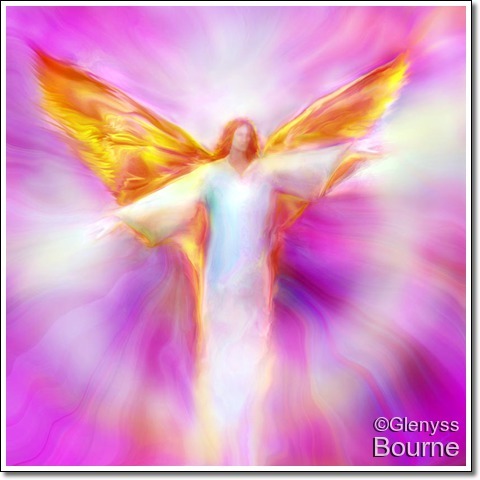 This is an interview with Glenyss Bourne where she discussed her many amazing experiences with Angels. 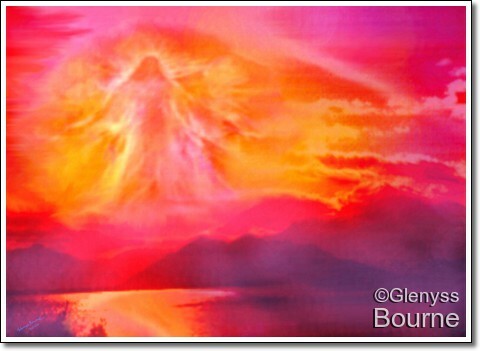 We all carry memories of heaven within, the purpose of my paintings is to help us to remember that we are Spirit and our friends and helpers are the Angels. They are ever with us! 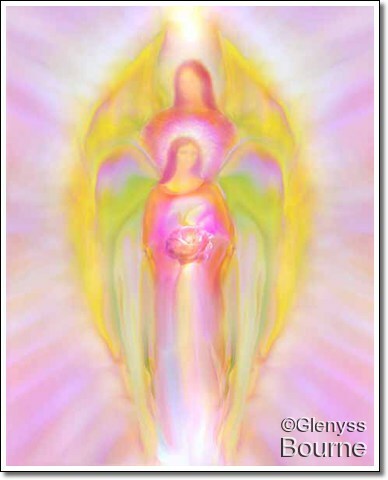 I received this beautiful email about a Angelic Energy pendant made from my painting of Jesus Unconditional Love. It was purchased from my Etsy Store. Hello Glenyss, Last week I received the Jesus loves you pendant. Immediately I felt something special, gentleness, peace. As though a very nice loving older brother entered into my life. I believe this is the most precious gift I ever got. It was a day after my birthday. A couple of days later I lost it on my way to my work, I rushed back to the place where I could have lost it. I the meantime I thought of the words: 'Before everything else look for the Kingdom of God and everything will come to you', I found it again and was very glad. I realize more than ever what is the most important thing in our life. It helps me constantly, today I had a singing lesson and when I held the pendant I could sing better. I ask inside me what I can do and the answer comes to me immediately. 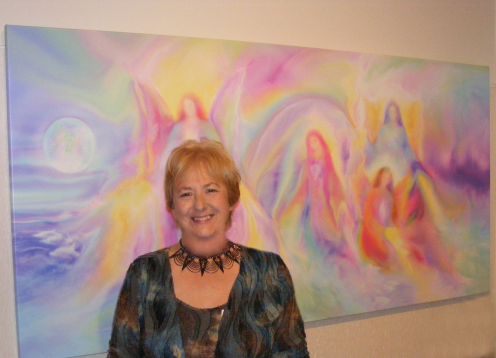 Intuitive angel artist, Glenyss Bourne sits down to talk with Spirits Voice at her Sanctuary Angel Art Gallery and Healing Centre in Victoria, Australia. 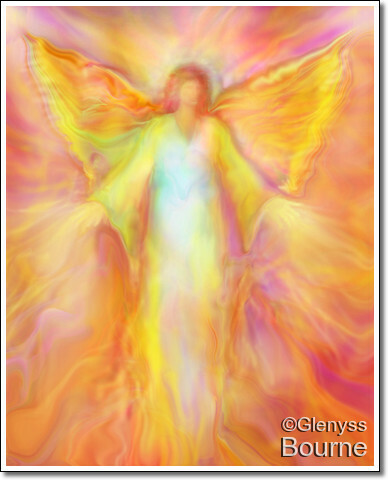 Glenyss shares her spiritual journey, explaining how her art evolved and became angelic in composition. Glenyss became very ill and spent over a year in hospital due to complications with surgery, but believes that the pain and suffering she endured offered an incredible opportunity for learning. 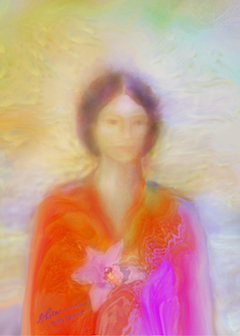 Not only did she dissolve her fears of dying, but she gained greater understanding of the healing that her angel art provides. 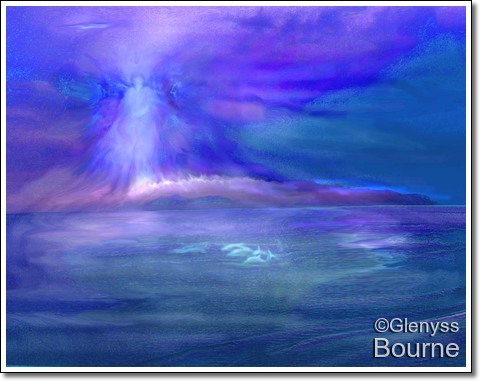 These days you will find Glenyss painting at her angel gallery and she finds that a people experience healing by simply visiting the Sanctuary and spending time surrounded by her art. Glenyss' beautiful artwork is also available for purchase online at www.anaheart.com. My 3 year old granddaughter was waking up every night saying there were monsters in her room. I told her to call on the angels to protect her and they would go away. Well that didn't work so I purchased the 8 x 10 print of Archangel Michael and Mother Mary for her room. When the prints arrived she was not home so I placed the print on her wall above her bed and the smaller one that you sent above my bed. Later that evening before going to bed she comes running in my room and says, "grandma I have an angel in my room and so do you". I said great what is his name, she said "Michael and he has wings that go like this". She has slept peacefully in her room every night since. I was looking through art, not for angels, when I saw your amazing work. I am intuitive, more and more the older I get. I had a very severe pneumonia a few years ago, I didn't realize at the time how sick I was, but I was hearing and seeing things in my fever that I can only explain now as probably due to being so close to death! Since then I've dreamed of angels. Only once. But too real to be a dream and THIS is what they looked like! Pale shades of brilliant light. Taller than me (a lot taller). I couldn't see their faces. I was taken to like a 'meeting room', and from what seemed like miles and miles away, although it only took moments, my best friend's Dad (who had passed) was brought to meet me. I said to the angels in GREAT excitement "it's Mr Murphy, It's HIM"!!! I couldn't see them speaking, but they seemed to speak (I am not crazy by the way). And they kind of 'chuckled' in good humor, and said something like 'Yes, we know'. Amazing to see them, on your page!